The goal of Wolf Creek Indian Village is to tell the story of the people who once lived in this valley 500 years ago. The rebuilding of their homes in the village is a large part of that story. But how were they constructed? What materials did they use? Using the only evidence we have, the actual map of the archeology site, the artifacts found, and scholarly thought of what is believed to have occurred is our only recourse to tell the story. In the first recreation of the village in 1996 the new village was mapped out according to the archeology map. It was decided to create wigwam structures. 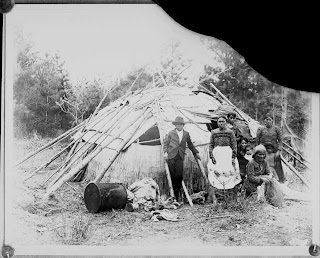 Research at that time said wigwams were the only structures they could have been since lines of post holes were in a round on the ground on the original site. The diameter of the circles were copied as well as the placement of the structures. Then materials to use became a matter of concern. Wigwams were thought to be covered by mostly bark but matting could also be used as in this picture of an Objiwe home in 1880 from the Library of Congress collections. These were Eastern Woodland Indians. 500 years ago they most likely had more resources for bark but today bark is not an easy material to acquire. It also is not a long lasting material but would need to be replaced every few years. 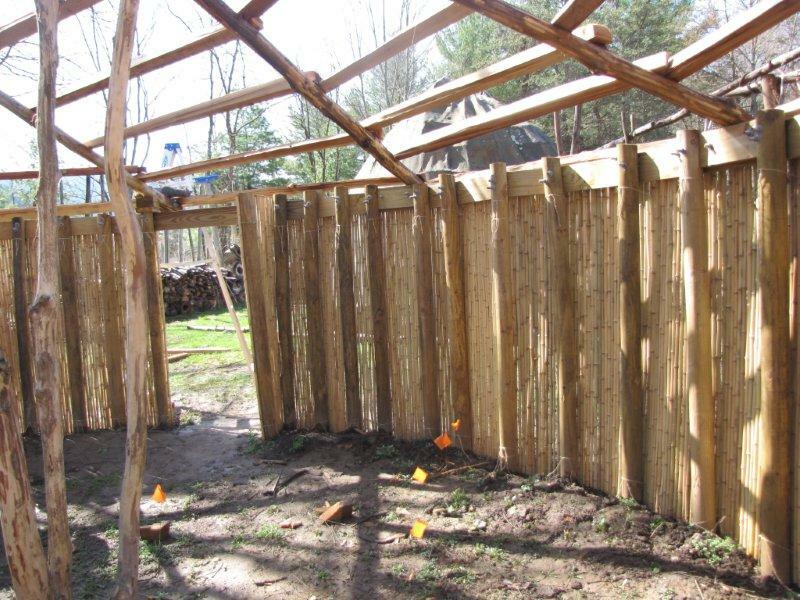 Instead the first construction were created with frames of wood and a more modern covering. 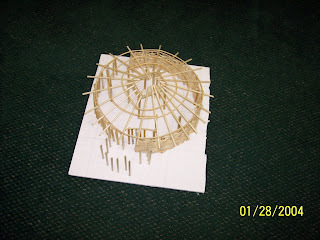 These structures did not mimic pole for pole of the map but in diameter it was correct. 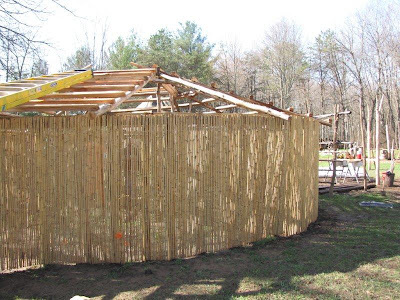 The coverings chosen for the new Wolf Creek Indian Village was fiberglass with a resin coating shell attached to a wooden frame. The structures allowed for natural light. The structures constructed the way they were, in the beginning the village was magnificent. 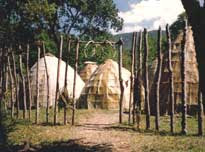 You felt the size and form of the original village. Alas we learned later there were structural problems in the construction that could not be sustained by the way they were built. The weight of the fiberglass and the size of the wigwams caused within 5 years the structures to begin to collapse. This picture was taken in 1999 and you can see through the gate the fiberglass beginning to buckle and split. But we discovered there were too many post molds on the map. Archeologist said they could have been rehabilitated posts. 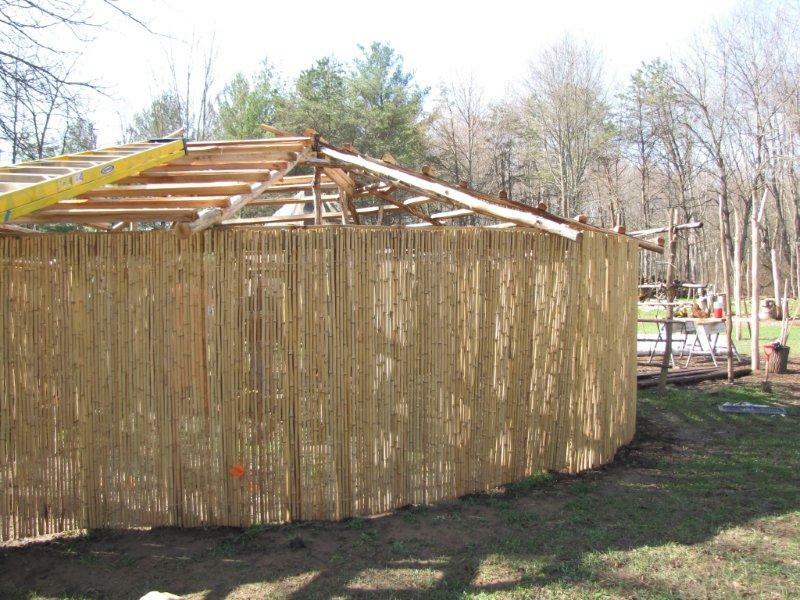 Perhaps, but over the years American Indians visiting Wolf Creek Indian Village would comment that our structures were very large for a wigwam and some mentioned that a wigwam in their tradition was not that permanent a structure for a village. We also liked the illustration of the Crab Orchard site meeting house below. 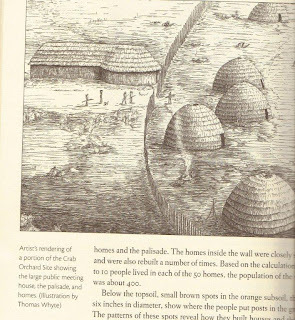 You can see this meeting lodge on the left of the drawing has a long rectangular annex attached to it, but the round part looks familiar. 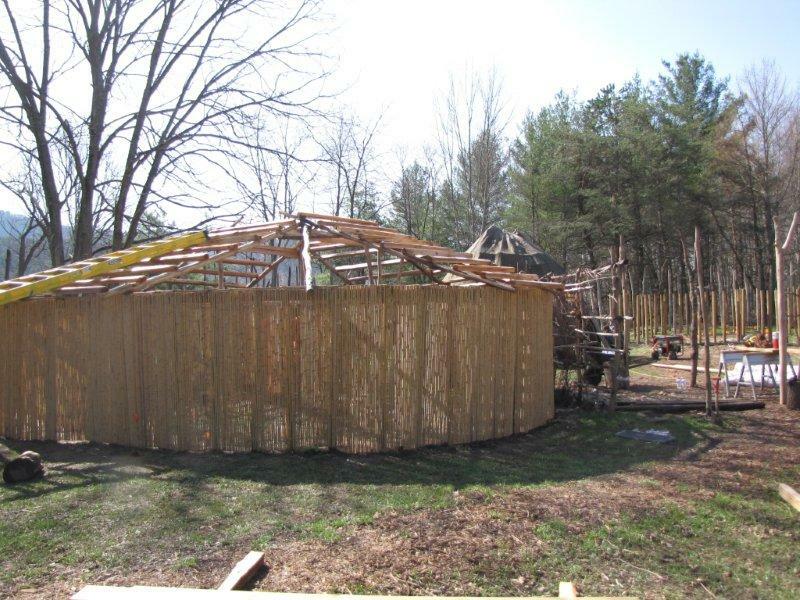 These structures began to make sense to us with what we had from the archeology site map. The artist illustration of Crab Orchard site in Tazewell County, VA is from the book "First People: Early Indians of Virginia," by Keith Egloff and Debra Woodward. 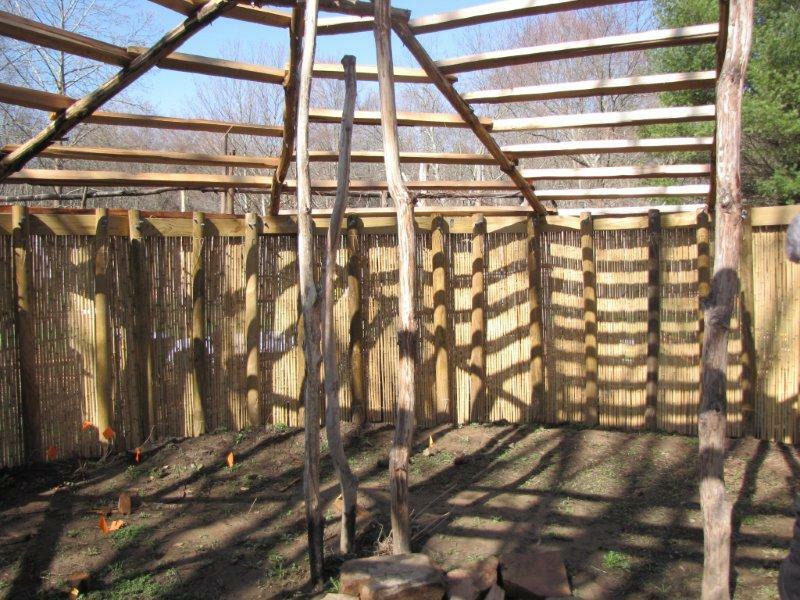 We consulted many more sources the book "Native American Architecture" by Peter Nabakov was vital too. So we restructured the meeting lodge as a round house and the model built in this manner we had no problem using every pole. Once we had the basic design we found we had to discover materials we could use that would mimic what could have been used 500 years ago that would not be hard to obtain. The walls would have to be covered and also the roof. The roof could have been thatched or bark. Bark is still not much of an option. But we found a synthetic bark called Flexibark that would last 30 years or more. 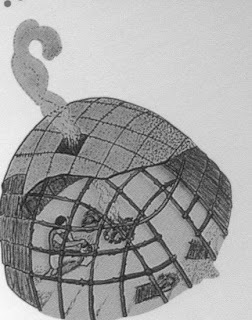 For the walls, many round houses had intertwined materials and were daubed with clay or had matting. Two years ago, a visitor mentioned she had been studying the uses of river cane among Native American populations in the east. We call river cane "North American Bamboo. She mentioned all of these uses first people found for this versitile plant. 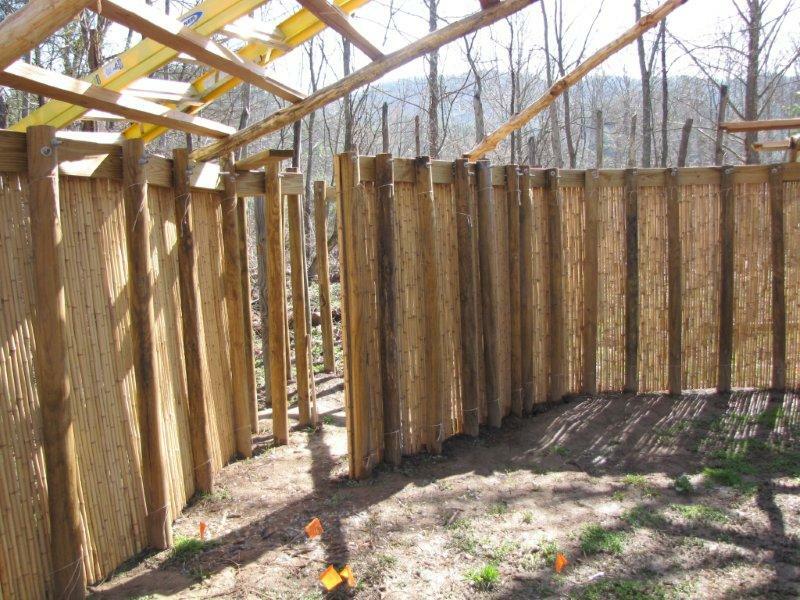 Matting, baskets, in construction of homes, flutes, blow guns, etc. and it peaked our curiousity. Could it have been used here? Research showed that River Cane would have been a plant our village would have known. We found county records that stated members of the Clear Fork community in 1804 came together to clear out the river cane to make way for a bridge across the creek. Further searches on the internet confirmed this was a plant that was here in abundance. It was depleted out to clear for farm land along with the filling in of wetlands. There was a recorded cane brake in Eastern Kentucky that spanned 15 miles!! River cane looks very similar to bamboo. We have a small patch of river cane started in our wetland but not enough to cover 13 structures. We found small bamboo can be purchased and that is what we are using. The outer wall of the round meeting lodge was put in place this week. The flexibark will be delivered Friday. The inner walls will have a matting and you won't even see the posts. Here are pictures of our progress. We know these structures mimic the archeology map of the Brown-Johnston site more accurately. 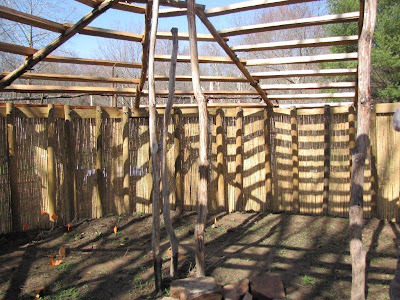 We could never know for sure what they had built for the original structures or what materials they used, but this construction will last much longer than the wigwam design as well as mimic the materials they could have used.